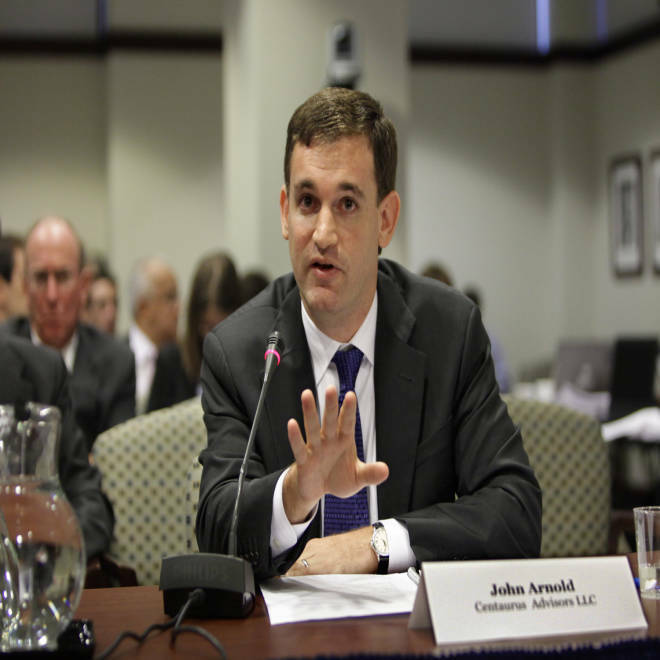 John Arnold, at the time the head of the hedge fund Centaurus Advisors of Houston, testifying before The Commodity Futures Trading Commission in Washington, in 2009. A philanthropic billionaire couple pledged up to $10 million in an effort to fund Head Start programs that could no longer operate due to the ongoing government shutdown, officials announced on Monday. Laura and John Arnold provided the money needed to reopen the seven Head Start programs in six states that were expecting to receive their federally allotted grants on Oct. 1 but were forced to close when the government closed many of their own offices on Tuesday, said Sally Aman, a Head Start spokeswoman. Head Start serves “the poorest of the poor in our country from ages 0-5 to get them ready for kindergarten,” Aman said. She added that over 7,000 children have been affected by the closures. "The Arnolds … have selflessly stepped up for Head Start children to ensure their path toward kindergarten readiness is not interrupted by the inability of government to get the nation's fiscal house in order," said Yasmina Vinci, Executive Director of the National Head Start Association, in a Head Start press release. Supporters of the Head Start Program rally to call for an end to the partial federal government shut down and fund the comprehensive education, health and nutrition service for low-income children and their families outside the U.S. Capitol on Oct. 2 in Washington, D.C. 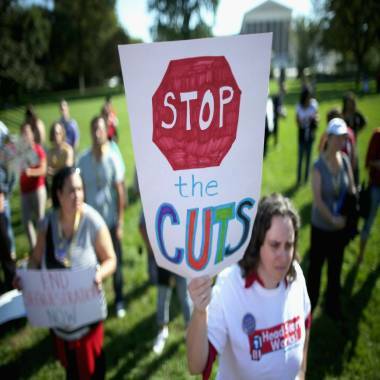 The Association noted that many low-income parents do not have the luxury of alternative care for their children and when Head Start centers close, they are forced to miss work. A former hedge fund manager, John Arnold, 39, is worth $2.8 billion, according to Forbes. He and his wife started a charity foundation bearing their name in 2008, but Larson said the $10 million that are giving to Head Start is a personal donation. The couple has three young children of their own, according to their publicist Gary Larson. “The Arnolds were both quite moved after learning about the impact the government shutdown would have on so many Head Start children, so they came forward personally, rather than through their foundation, and offered this assistance as their way of helping,” Larson said. Aman said many of the programs will be able to reopen their doors on Tuesday, but said the “generous gift” would not support Head Start programs that are still at risk of closing if the shutdown persists through October. If the shutdown continues more Head Start programs that serve an additional 11,000 children will also start to shutter in the coming weeks, Aman said. And $10 million is only enough to fund the seven programs that the money was allotted for through the end of the month. “We sincerely hope that our government gets back to work in short order, as private dollars cannot in the long term replace government commitments," the Arnolds said in the statement.